In the lead up to the prestigious Outstanding Security Performance Awards (OSPAs) awards ceremony and dinner, Infologue are going to cover the leading four nominations that have been shortlisted for the 2018 OSPA Lifetime Achievement Award, and as voted for by the judges. This prominent award recognises a senior member of the security community who has been working in the industry for over 30 years. It acknowledges an individual who has consistently shown outstanding performance and who has had a substantial impact upon designing and driving standards in the security sector. Stuart Lowden CSyP FSyI has been shortlisted for this year’s UK OSPAs Lifetime Achievement Award. Stuart Lowden has worked in the security industry for 32 years. He is well-regarded for professionalising security and advocating positive change in the industry, from best working practices, to quality and client-centric innovation. Stuart is currently Executive Director at Wilson James, the foremost supplier of security and logistics services. When he joined Wilson James as Managing Director for Security in 1997, Stuart introduced radical staff welfare policies and these remain a core component of the company’s offering. He replaced the typical 56-hour week with a modern 42-hour roster. Staff were allowed to work some overtime but the choice was theirs; long hours were not forced on them. For almost 20 years, Stuart and the security management team have proven that clients will pay a slight premium for security staff to enjoy the same quality of life as their own employees. In their current security portfolio, more than 90% of Wilson James clients adhere to the 42-hour week. This approach is supported by a robust learning and development framework and the company still provides more training per employee than any other security company. Stuart champions ethical working practices beyond Wilson James, having written articles and spoken publically about security officers’ working hours. He passionately believes that change is needed if the industry is ever to become a career of choice, rather than one of last resort. He has argued that one of the biggest obstacles to positive change is the way in which many companies opt-out of the Working Time Regulations, rather than granting employees any genuine choice. He believes that only when this practice is removed – by regulation, if need be – will the industry change its perception among the outside world and the employees currently in it. With his experience and insight, Stuart has also been actively involved in the leading security industry bodies. He was a member of the ASIS working party that founded the Security Institute in 2000 and served on the Board from 2002 to 2008. The Institute is the leading representative body for security professionals in the UK with over 1,000 members. 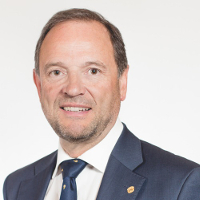 From 2004 to 2006 he was Chairman of the UK Chapter of ASIS International, a US-based organisation with over 40,000 members worldwide, 700 of which are based in the UK. From 2008 to 2010, Stuart was Chairman of the British Security Industry Association (BSIA). Members’ combined turnover is approximately £3 billion and the association represents 70% of the UK’s security industry. From 2011 to 2015, he was BSIA Chairman of the Manned Security Services section and from 2013 to 2015 was Skills for Security Acting Chairman. Serving on the Board from its inception, the industry’s sector skills body was formed in 2006 when the security industry became regulated by the SIA (Security Industry Authority – part of the Home Office). As Managing Director for Security from 1997 to 2014, Stuart built Wilson James’ security sector from foundation to a £72m business and a ‘Top 10’ UK security company. Stuart is a dynamic and engaging leader whose success within Wilson James and in his roles for industry bodies is building a tremendous legacy. As a vocal advocate for better working practices, Stuart has set a high standard for the industry to follow. Wilson James employees have dedicated time and increased budgets year-on-year for training with market-leading work-life balance. Wilson James continues to enjoy a client retention rate of 95% over the last 5 years, which is testament to how satisfied clients are with their security teams. Moreover, Stuart’s leadership resulted in Wilson James winning numerous industry awards during his tenure, including awards recognising manned guarding excellence, leadership in HR and training initiatives, and high levels of customer care and service. These accolades underpin Stuart’s belief that our greatest asset is our people. Stuart is consistently pushing quality standards for Wilson James and the security industry as a whole. This was evidenced by winning the ‘Contribution to Standards’ award in 2014, recognising the company’s security management system that protects people, goods, transportation, equipment and infrastructure against security incidents and other potentially devastating situations. Wilson James is the only known security company to have this standard. This is the benchmark for all other security companies to follow. Stuart Lowden is an individual with 32 years industry experience at a senior level. He is highly regarded and identifiable as someone who believes in people, quality and innovation. His drive and passion to make the security industry an employer of choice is truly deserving of the ‘Lifetime Achievement Award’. Founded in 1997, Infologue.com was the first security industry internet news provider and has consistently been at the forefront of using innovative methods in dispensing the latest news to the security industry. The presentation of the Outstanding Security Performance Awards (OSPAs) will take place on Thursday 1st March 2018 at The Royal Lancaster London. Please visit the UK OSPAs website to book and find out more information. The Lifetime Achievement Award is sponsored by the Security Institute.